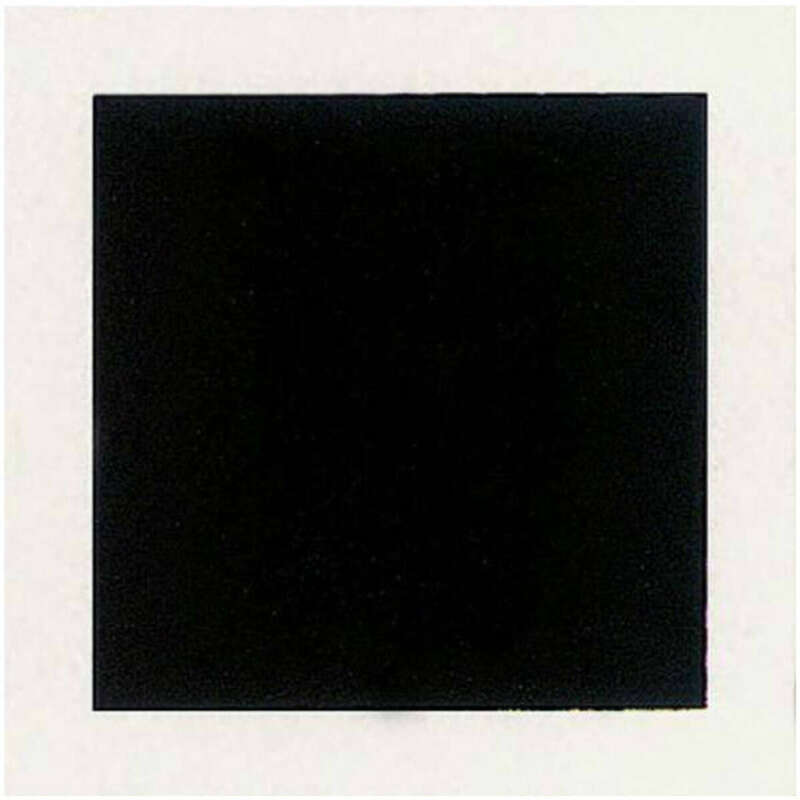 Black has had a grip on fashion that predates the recent minimalist revival; it appealed to the artistic classes of the late 19th century who enjoyed the brooding, monastic quality and wore it in rejection of the tweed excesses of their predecessors. In the 1980s a wave of Japanese designers like Issey Miyake, Rei Kuwabako & Yohji Yamamoto embraced blacks raw, sculptural quality to create expressive pieces that defined the era. In 2015 it appears that black, once again, is having a moment, with everyone from cyberpunk wannabes, street wear enthusiasts and high fashion denizens getting in on the action. 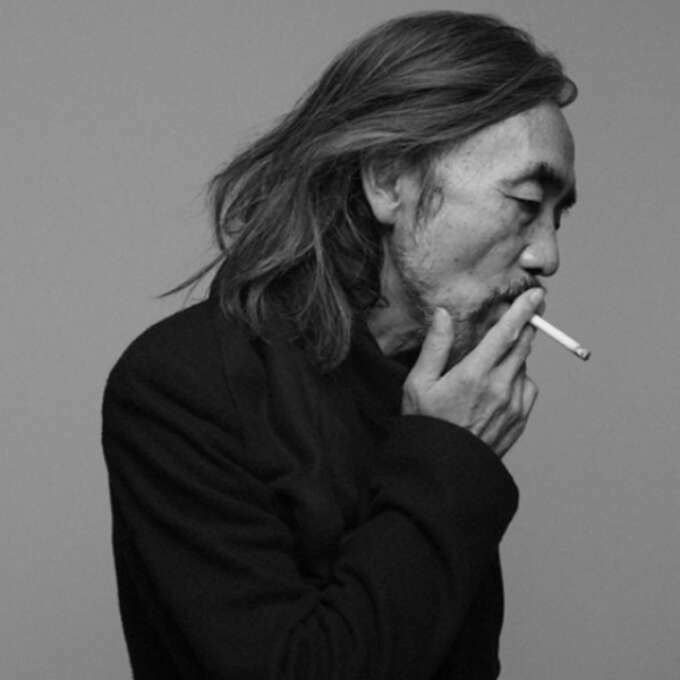 Japanese designer Yohji Yamamoto has long lived & worked in monochrome. This is interesting because despite the fact that it is generally flattering (a sort of camouflage that makes those with larger figures appear svelte and smaller figures waifish) Its not the easiest look to pull off consistently. When worn badly, black risks looking severe, melodramatic or boring, in the worst cases all three at once. Alexander Wang is a master of black dress, tweaking ubiquitious sportswear to create something both modern and elegant. The key to wearing black then lies in embracing its obvious limitations. Without colour & pattern, you are left with texture and shape of the garments which you must pay special attention to. 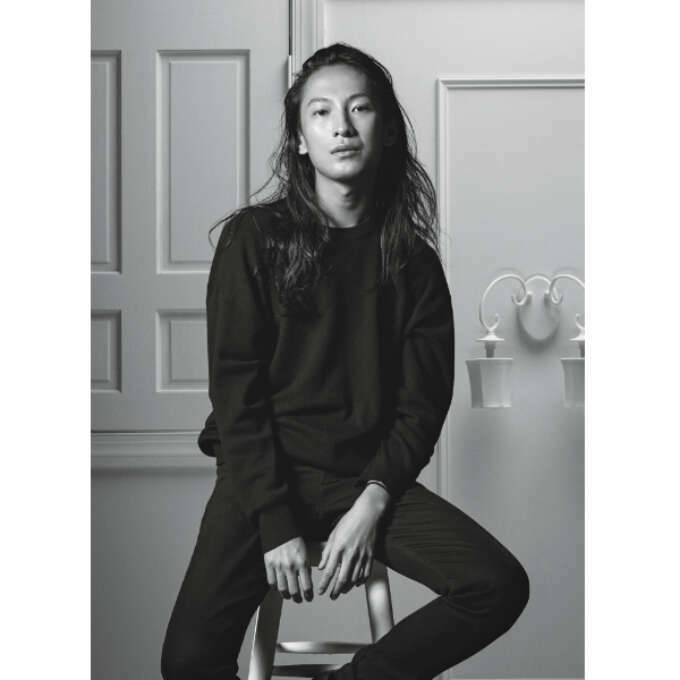 In this respect I’ve always thought that the designer Alexander Wang in particular was a master. His loosely cut and finely textured basics softened the foreboding quality of black clothing and through careful tweaking of fit and finish, he managed to imbue generic sportswear with a previously unseen elegance. Also notable in a more formal mode is the work of fêted French designer Christopher Lemaire, whose loosely draped outfits reference classic dress traditions without losing their inherent modernity. French designer Christophe Lemaire wears black more formally than Wang but with no less flair. I was prompted to write by a friend of mine, who has recently transitioned into a strictly monochrome uniform. In a light bomber, slim jeans and black t-shirt he manages to look sharp, interesting but unfussy, which is essentially black clothing as it should be. He has very much found his look—the kind that gives you a sense of confidence and ease. He can now can go on to build a wardrobe of long-lasting, good quality pieces. In this spirit I’ve put together my personal take on the perfect black capsule wardrobe, with an emphasis on comfort, longevity, harmony of texture and shape. 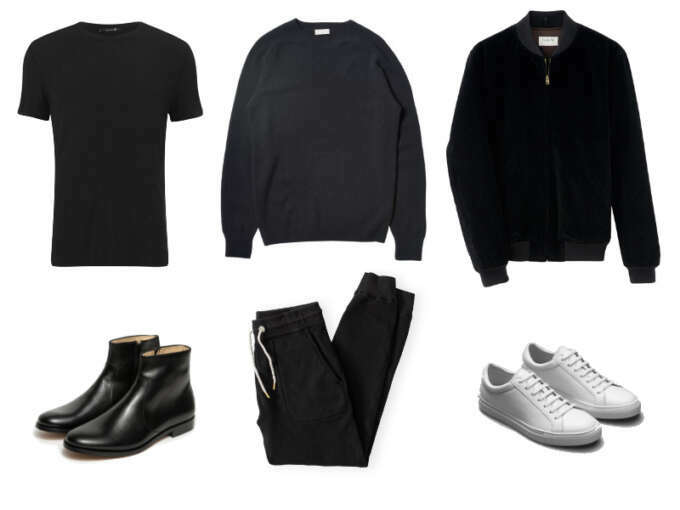 Clockwise from left: Alexander Wang Slub Rayon-Silk tee, Margaret Howell Cashmere-Merino Crew sweater, Louis W. for A.P.C ‘Paddy’ jacket, Erik Schedin leather sneakers, Victor Athletics Jogger pant A.P.C classic boots. For the core pieces I’ve chosen items with a distinct character and feel. While its hard to evoke in the images, the Alexander Wang rayon silk is incredibly soft and drapes very well. Margaret Howell’s saddle crew sweaters are extremely soft and the merino blend will last a good bit longer than straight cashmere. Louis W. has been doing interesting things with leather jackets over at apc but this year included some textured cloth bombers including this jacket, which is made of a beautiful Italian cord, again adding texture to the flatness of the black outfit. Shoes-wise I’ve gone with Erik Schedin’s classic sneakers (which predate and possibly created the upscale sneaker trend) for a great basic, and apc zip boots for something dressier. There are a lot of ‘tailored’ sweats on the market, some with blends of wool or other upmarket materials but often these are simply grossly over-priced, Victor Athletics are a new brand out of the states but their gear has a great cut, competitive pricing and nice suble details like the gold hardware on the draw string. 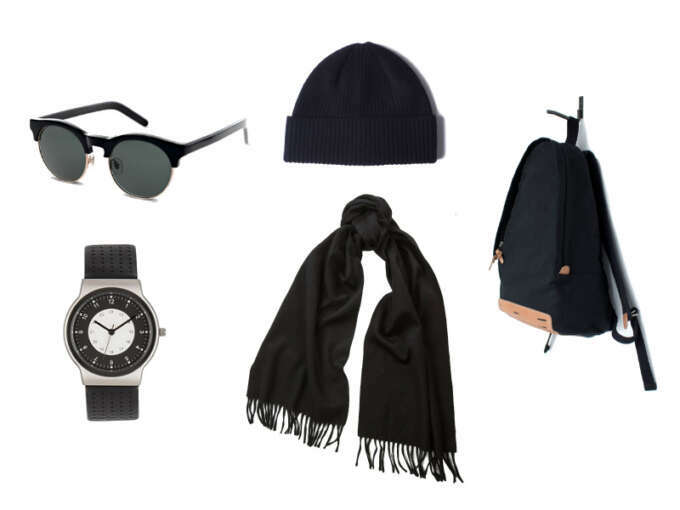 Clockwise from top left: Han Kobenhavn ‘Smith’ Sunglasses, Howlin ‘Mahoney’ hat, Makr Dayback, Begg & Co Angora-Lambswool ‘Jura’ Scarf,Muji 2 tone watch. Clockwise from top left: rubberized cotton Macintosh jacket, Lemaire Wool flannel trousers, Commes Des Garcons shirt forever, J.M. 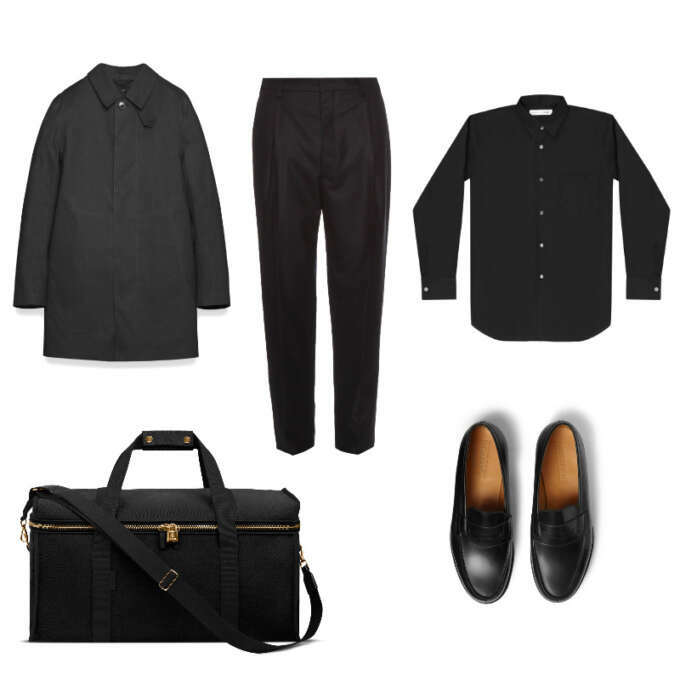 Weston loafers,l/Uniform No.35 bag.